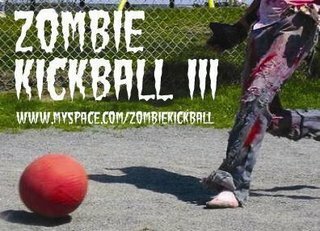 A third annual Zombie Kickball outbreak looms over Portland this weekend. Preparty at The Asylum, 121 Center St., at 9 p.m. June 27. Kickball game at Carter Field on the Eastern Promenade at 2 p.m. June 29. Followed by after party at Space gallery, 538 Congress St.
A report in the Portland Press Herald.